You’re making widgets and closing deals. You’re focused on your business. What started out as a side hustle is taking off. During this time you’re pinching pennies. Insurance is the last thing on your mind. You have homeowners insurance….you’re covered right? You wouldn’t go to a party naked would you? Your homeowners insurance is designed for just that, your home. Here a some things to be mindful of if you’re running a business from home. Computers, furniture, inventory…all of this could be considered business personal property. A homeowners policy will generally provide $2,500 of coverage for business personal property at your home. This would be excluded from your home policy…paper and electronic media. Business liability is excluded from Missouri homeowners policies. You never have any customers come to your home, so you’re fine…right? What about the packages your receive for your business. If that delivery person falls and is injured, your homeowners policy doesn’t cover your business. When it comes to liability, don’t risk more than you can afford. A lawsuit doesn’t take long to add up. You’re also putting your personal assets on the line too. If your house blows away and you can’t run your business, how will you pay for ongoing business expenses? Homeowners insurance does not and will not cover your employee(s) who are injured on the job. Nor are you covered if you’re accused of any kind of mistreatment of employees (i.e. wrongful termination, sexual harassment, etc). You guessed it, your homeowners policy won’t cover it. Realtors, lawyers, real estate appraisers would need a Professional Liability policy. Also known as Errors and Omissions insurance; it covers what you do and provides defense costs. Of course you’re probably already aware, your home policy doesn’t cover your car or truck. But while we’re on the subject of your autos and your business; if you’re using an auto during the course of business, make sure they’re properly covered. Your homeowners insurance isn’t intended to protect your business. However, depending on the type of business you own, you may be able add a home-based business endorsement to your homeowners policy. It really depends on the type of business you’re running out of your home whether or not the home-based business endorsement will cover your needs. You may be better off with a separate, stand-alone Business Owners Policy (BOP). Take some time and talk with your insurance about your business needs and homeowners insurance. You have a lot of time invested in your business. The last thing you want is a claim being denied. Or worse yet, your home insurance company canceling your policy due to the business in your home. 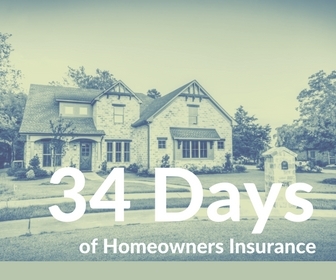 Are you ready for more 34 Days of Homeowners Insurance? If you answered yes, click here.